AKIPRESS.COM - Thousands of animals have suddenly died in western Mongolia due to a virus that is afflicting sheep, Cashmere goats and the endangered saiga, which is an Asian antelope, reports Seeker. Wildlife Conservation Society (WCS) veterinarians have raced to the area in hopes of containing the epidemic, which is threatening not only these and other animals, but also the welfare of people living in the region. The cause is believed to be a virus known as "Peste des Petits Ruminants," or PPR. People are not thought to be at risk for the viral disease that most commonly sickens goats and sheep. It can cause fever, digestive problems, pneumonia and sometimes death. The virus was first reported in 1942 at Africa's Ivory Coast, but has since spread to other countries around the globe. "PPR is a serious disease of domestic small ruminants," WCS Mongolia country director Enkhtuvshin Shiilegdamba told Seeker. Ruminants are hoofed mammals that chew cud. "Mongolia's food security — sheep — and a significant component of its economy — Cashmere goats — are dependent on livestock." While resulting food shortages would likely only impact locals, the luxurious cashmere wool is transported all around the world, so the epidemic could affect its supply. Shiilegdamba and her colleagues believe that the virus was transmitted from China through goats and sheep. There is a vaccine, so it is being given to as many animals as possible now. It is difficult to vaccinate wildlife, however, which are dying by the thousands. 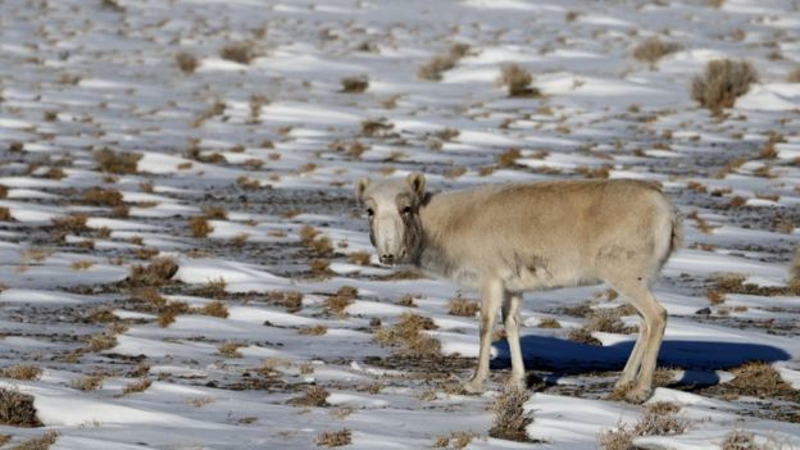 An estimated 2,500 saiga have recently perished, taking out a quarter of the local population of this already endangered antelope, according to WCS. "This die-off suggests that saiga antelope are highly susceptible to the disease and it is likely that over half of the population will be lost in this initial wave of disease transmission," Shiilegdamba said. PPR is also believed to infect gazelle, ibex, endangered wild Bactrian camels, wild boars and other animals. The deaths of these animals are expected to hurt apex predators, such as wolves and snow leopards, which are endangered and on the IUCN Red List of Threatened Species. "All of the currently affected species are snow leopard prey, and mass mortalities may lead to depletion of snow leopard food resources and may increase the livestock and wildlife conflict, as snow leopards are likely to attack livestock if their major prey species are depleted," Shiilegdamba said. "Herders may shoot if wildlife attacks their livestock or their herd, and may create a big conflict," continued Shiilegdamba. "All of this becomes evidence of ecosystem disturbance." Even birds of prey are expected to be affected, since they feed on young saiga and Mongolian gazelle during calving season. During breeding and calving seasons, Mongolian gazelle form large groups, which Shiilegdamba suspects "makes it very easy for the virus to move quickly through an entire population." As of now, the virus continues to spread and has not been contained. The current scene is quite grim, with veterinarians in protective clothing incinerating piles of dead animals, hoping to prevent the virus' spread.